Weather in Arkansas is truly spazzy. Last Monday, we're iced in...this one, it's warm enough to patio hop. 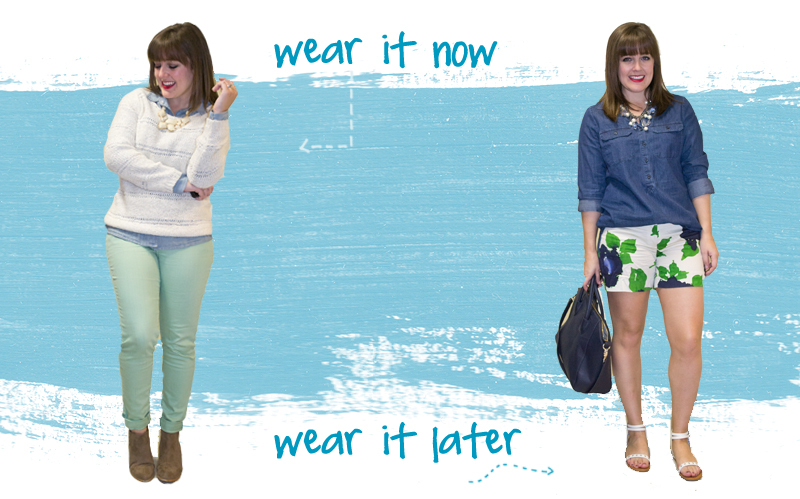 Thankfully, you can still incorporate more spring-like pieces into your daily wardrobe with a few fixes and layers! I wrote a piece today for the new LittleRockSoiree.com on three spring trends you probably have in your closet already...and now, I'm going to show you how to wear each of those pieces no matter what the weather may bring. I feel like we've established that chambray is here to stay. So pull it out of the back of your closet and layer it under a chunky sweater if you're feeling chilly...then enjoy it this summer with a pair of floral shorts. Maxi dresses are the first thing I throw on if I'm in a "grab and go" kind of mood. You can winterize your maxi by layering a sweater or cardigan over it; adding a belt can keep the ensemble from getting too frumpy. Then, when warmer weather rolls around, swap your sweater for a fedora. I'm hoping you didn't trash all of your wide leg and bootcut jeans for skinnies! Wide leg jeans and pants are all over the place this spring, and a look I love is pairing wide legs with super trendy cropped tops. When it's cold, you can layer a crop over a button up for a cute look that's fun for work or play. Once it warms up, a swingy crop with high-waist wide jeans and wedges is perfect for brunch on the patio at Red Door. What are some of your favorite ways to transition into spring?